What is the salamander in the Packrafting Store logo all about? How do you inflate the boat without pump? What happens if I hit a rock? How come product prices in Packrating Store (in €) work out higher than listed in America (in $)? Why are packrafts so expensive? My boat feels like it is deflating by itself! There are black marks on boat. How come? My sprayskirt becomes lose, the coaming is not tight. I have questions regarding packrafting in general. How can I be helped? 1. What is the salamander in the Packrafting Store logo all about? The salamander is an amphibian. This means it lives in water and on land, just like packrafting folks. It is a symbol for combined activities of hiking and boating, which is the core concept of packrafting. Thus, we choose it as our logo. 2. How do you inflate the boat without a pump? 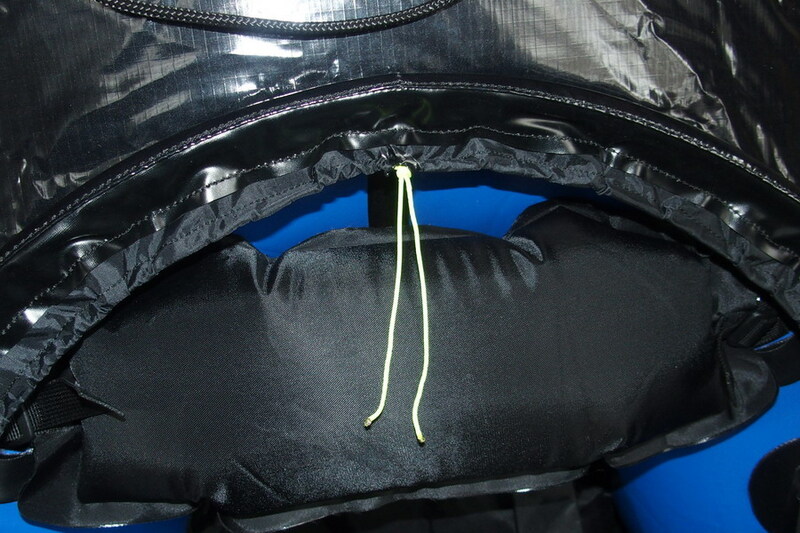 Packrafts come with a light nylon bag with a screw nozzle in the bottom which is attached to the raft. The boat is inflated by scooping air into the bag (using a breeze helps), then sealing the bag’s open end and squashing the air into the boat. After about ten ‘scoops’ the raft is 90% inflated. Now unscrew the inflation bag, screw in the cap quickly then top off the pressure using the mouth valve. You’ll find an illustration here. 3. What happens if I hit a rock? No worries, the rock will be fine ;) And likewise the boat! 4. How come packraft prices at the Packrating Store (€) work out higher than in the US ($)? The prices stated at the Packrafting Store are what a customer within the European Union effectively pays and purchases above €500 are post free. This will actually cost you less than importing a boat yourself. You don’t have any hassle of customs clearance and the package comes directly to your door. In the event of warranty claims, returns are easier and cancellations are no problem. US Dollar ($) are net prices and do not include the EU importation duties and sales tax (VAT) which are also levied on the cost of shipping. Moreover, most banks charge a purchase fee of 1-2% for shopping by credit card overseas respectively the odd exchange rate for foreign currency. 5. Why are packrafts so expensive? They are actually not, if considering high tech material and workmenship. The boats are handmade and are proper boats suited to whitewater and wilderness use, not pool toys mass produced. Just like parachutes or mountain bikes, they are built to meet certain requirements and currently the best way to achieve these aims is to specify customised fabrics with unique coatings and then to assemble it all by hand. The result is a tough and sophisticated design that bears no relation to vaguely similar-looking pool toys. As the saying goes: ‘you get what you pay for’. 6. What do customers say? 7. My boat feels like its is deflating! This is possible, but unlikely - each boat is tested for air tightness before leaving the factory. Usually this is the result of what is called the tempering effect. The warm air used to fill the boat cools and contracts on contact with cold water. As a result the air pressure inside the boat drops and it feels less firm. Put the boat on the water for a couple of minutes - even splash the whole boat on a hot day to cool the air inside it. Then give a couple more pumps through the twist lock valve and you’re good to go. (For the same reasons of pressure and temperature, avoid leaving your boat on land in the baking sun. Put it in the shade or leave it on the water and give it the odd splash). It won’t burst but the seams will appreciate it. Still worried about leakage? Inflate the boat at home, secure all the valves and leave indoors overnight. Assuming the room has not cooled down significantly the raft should still be fully inflated next morning. 8. There are black marks on boat. How come? The urethane surface is resistant to everything from water, air, sun and soil. In particular, it stubbornly withstands impact stresses such as contact with rock. However, it loves the textile dye from zips and grab loops! A tightly packed boat can thus get some spots and stripes in transit. Yellow and red boats are more affected than green and blue ones. This unwanted tattoo actually penetrates into the urethane and cannot be removed but it has no functional impact. If you want to avoid these cosmetic changes, make sure the zippers and grab loops have no contact with the tubes when packing up. 9. My sprayskirt becomes lose, the coaming is not tight. The model Alligator 2S will come untightened. Please re-pull the cord by about 10cm with a new knot. This will tighten the coaming (compare picture). The process can be rough-running, please do without the coaming segments and the boat non-inflated. Use a pair of pliers to pull the thin cord, if needed. Just do not pull against the channel, but in running direction to avoid tears. 10. I have questions regarding packrafting in general. How can I be helped? We share a personal Packrafting blog on Tips and Tricks, alternating in English and German. It is connected to a European Facebook Groupe too. Other than that you will find some stuff on simple Google search and Youtube. Many people report on their experience and the theme. Packrafting is community based knowledge. 11. Do you do PayPal? Yes, it is incorporated in our payment options at the checkout. You can also make the payment manually to info@packrafting-store.eu. If it does not make a difference to you, we prefer a direct bank transfer however, as PayPal is charging the usual fees our end. You will find the payment details (IBAN) in your order confirmation as well as with selecting the payment option for an EU-direkt standard transfer, with low cost on either side. 12. What about Express shipping? We can arrange just any kind of express delivery like UPS express or similar, which can deliver within two days to most places in the EU. Give us a quick note on date and destination and we will quote for the extra cost. For example, a delivery to Prague next day is 40€.